Last Wednesday he was on CNN answering the questions about his relevance and how it felt to be 65. Last Thursday he was in Pontiac, Mich., campaigning for attorney general Amos Williams and to help prevent Proposal 2 from going into effect. Last Friday he was inside the Sacramento Kings' locker room. But this time there were no cameras, no invited media pundits, no staged junket -- nothing to serve his personal purpose, like so many of the "events" he shows up at where he's accused of being there for himself and not for the people in the middle of the storm. This time Jesse Jackson was legit. Sincere. He knew this had nothing to do with him. 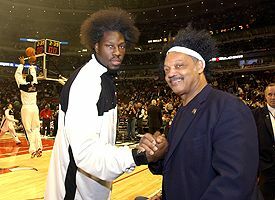 He first went to the Bulls' locker room and asked Ben Wallace to come with him. Unable to say no, Wallace followed him down the corridor into the locker room of the team that had just beaten the Bulls by one, after the Bulls had a four-point lead with 17 seconds left. Back in the mirrored area, where the media is not allowed, Ron Artest was finishing getting dressed. Ron, meet Ben. Ben, meet Ron. Let us pray. For so long he's been accused of being a lot of things -- grandstander, opportunist, philanderer, agitator, instigator are just a few words that often accompany his name -- but being a bird of prey in this was not one of them. In the name of sports -- of which he is a huge fan -- Jesse Jackson came genuine. No hidden agenda, no self-indulgent prophecy, no political posturing, no grandstanding. No selfishness. This is good. My feelings about Jesse Jackson mirror my feelings about Bill Clinton: Both have great gifts, faith, and a desire for the common good. And both have flaws that keep hindering their work and obscuring their many actions for good. A house divided will not stand. Which house do you suppose Jackson was intending to unite? Once again.... parallel universe, dude. Parallel universe. After last Tuesday, I've had quite an enjoyable week. How about you? Well, one thing's for sure. I was disappointed, as you might have guessed. But I hardly see how you gloating about the Dems victory at the polls has anything to do with Jesse Jackson. I'm going to make a prediction here. If Hillary wins the Dem nomination in 2008 (and heaven forbid, wins the general), Republicans will regain one the houses soon after, perhaps both. You're already seeing that the Dems think they have a mandate from the people to move further toward socialism. And make no mistake, that's what they are. I anticipate objections here, but they are easily disproven. Hillary is a known socialist thinker, as Bill was (though slightly less radical). So in your perfect world so far, we know have Moyers for president, and Jesse Jackson for .... Senate Chaplain? Big smile ... big smile. I'm 23 and raised in South Georgia. Never ever have I had an opportunity to gloat until now. Hillary won't get my vote in the primary. In '04, I campaigned for Edwards and unless someone better comes along - he will likely get my support again. Actually, Governor Warner of Virginia had my eye until he pulled out. It's hard to argue with you about Hillary. The night of the election, MSNBC had Joe Scarborough and Pat Buchanan calling Hillary a "centrist Senator" and a "hawk" but yet you've labeled her a "known socialist thinker." But Jesse isn't just a media whore. That's what I hoped to convey in my post. Not Obama? Not Biden? I figured you'd be all over them -- Obama the minority, a Dem, a moderate (aka liberal) on most issues. Biden very anti-war, chair of foreign relations committee, moderate-liberal. No? Worst Person In The World!